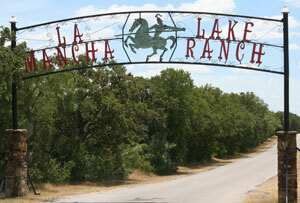 Welcome to LaMancha Lake Ranch located on beautiful Lake Leon in Eastland County, Texas. We offer cabin rentals ranging from simple one room units to a stylish 2-story structure with two living areas, or for the rv’ers, the perfect hookups. We have dimmed our lights in an effort to participate in the "Dark Sky" movement. The ranch is darker than it used to be, so for your own safety, please bring a flashlight to help you find your way at night. Click here to learn more about the Dark Sky Initiative. Drive through our gates and take a look around. You might just find that perfect spot for a weekend getaway with that special person or the family, or for that week long family reunion! Lake Leon offers plenty of fun on the water whether fishing, skiing, paddle boats or watercraft, this year we have plenty of water. If you were anywhere in Texas during the summer of 2011 you know the state had the worst drought and heat in history. Hopefully that’s gone. For booking, please call us at 254-647-3651.